I’ve been asked to offer more pasta dishes at the Chef’s Table in the cafe at work, so this week I’m making a rich and creamy tomato basil pasta with a small side salad dressed with my great grandmother’s simple Italian dressing. This is a one-dish dinner for those of you looking for something quick and easy to prepare after work. Cook the pasta according to package directions, drain and set aside in a large bowl (or I personally just put it back in the pot I cooked it in and use that in place of a bowl for easy cleanup). In a large saute pan, heat the olive oil over medium high heat. Add the chicken tenders and cook 4-6 minutes or until thoroughly cooked through. Remove the tenders and dice them into bite-size chunks. Add the wine to the pan to “deglaze”, swirling around and scraping up any burnt bits that are on the bottom of the pan. Add the vinaigrette, spinach, grape tomatoes, basil leaves, chicken broth and the Neufchatel cheese in that order, then add the garlic powder and black pepper. Turn heat down to medium low and cook, stirring constantly, until a creamy thick sauce is produced (3-4 minutes). Add the diced chicken to the sauce and combine. Pour the sauce/chicken mixture over the pasta and toss well to combine. Sprinkle each plate with the shredded Parmesan just prior to serving. This is how my great grandmother made a simple Italian vinaigrette to dress salads on a daily basis. Put 1 clove of garlic in a coffee cup. Add 1/2 tsp salt and crush the garlic and salt together with the end of any kitchen tool that’s blunt enough to do so. Add the juice of 1 lemon and enough olive oil to incorporate. 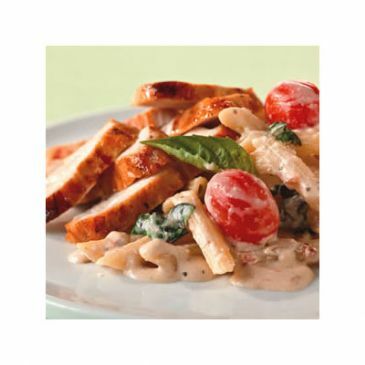 This entry was posted in Entree and tagged basil, broth, chicken, garlic, Neufchatel, one dish meal, parmesan, pasta dish, penne, spinach, sundried tomato, tomato by quarlj01. Bookmark the permalink. This looks wonderful! I will definately try it!